Arizona Cardinals fans were relieved to learn that wide receiver Larry Fitzgerald will be back for the 2017 season. Had he retired, the Cardinals would have lost a vital cog in Coach Bruce Arians’ offense. Larry Fitzgerald recently confirmed that he will forgo retirement, and play during the 2017 season. Sighs of relief were heard across Arizona. The prospect of Fitzgerald retiring had Cardinals fans understandably anxious. 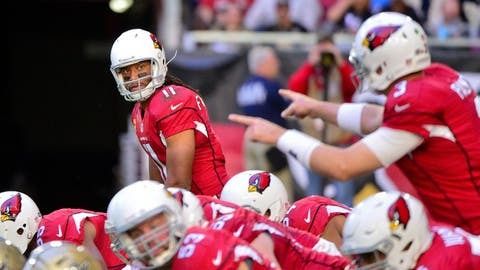 In addition to being one of the best receivers to ever play the game, Fitzgerald is the most beloved Cardinals player of the contemporary era – and perhaps any era. Had Fitzgerald opted for retirement, however, the Cardinals would have lost more than the face of the franchise and an all-time great. The Cardinals would have lost one of the most important positions in Coach Bruce Arians’ offense – the Hines Ward slot receiver. During Coach Arians’ tenure as offensive coordinator for the Steelers, Hines Ward’s play in the slot was an essential cog in the Steelers’ offense. The importance of this role involved a combination of receiving and blocking – two areas in which Ward excelled. In fact, in addition to his talents catching the ball, Ward was widely recognized as the best blocking receiver in the league. The receiver who plays this position in a Bruce Arians offense is both an important playmaker in the middle of the field, and a crucial contributor to the success of the running game. This player must be physical, strong, and sure-handed. In other words, a player like Larry Fitzgerald. Fitzgerald was originally apprehensive about the move to slot receiver. But in true Fitzgerald style, he placed the success of the team first, and trusted Coach Arians. Though it took time for Fitzgerald to acclimate to the move, he has thrived in the role and has been lauded for his superb blocking. The move has also been a windfall to Fitzgerald’s production. In a sense, Coach Arians has designed his offense to reward the slot receiver for blocking, by making them the primary playmaker in the middle of the field. As a result, Fitzgerald’s receiving numbers have increased significantly in this role. As the Cardinals continue to build their offense around budding star, David Johnson, the blocking of the slot receiver will become increasingly indispensable to the Cardinals’ offense. Though Fitzgerald is not retiring just yet, the Cardinals will need to find the heir apparent to the Hines Ward slot receiver sooner, rather than later. With this in mind, do not be surprised if the Cardinals select a big, physical receiver during the first two days of the 2017 NFL draft. In the meantime, it’s good to have you back, Fitz.